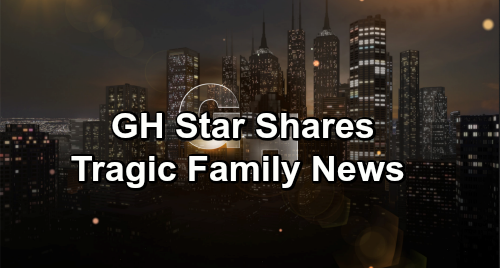 General Hospital (GH) spoilers has some sad news to pass on about the family member of a popular GH star. Emme Rylan, who portrays Lulu Falconeri on the ABC soap, has revealed on social media that her sister Lara is battling stage 4 cancer. According to Lara’s GoFundMe page, Lara learned that she had cancer in October 2018 after experiencing severe lower back pain that interfered with her ability to work and even to walk. After an MRI, doctors diagnosed her with stage 4 metastatic cancer, and unfortunately there is no cure. Since Lara has been a very giving person and has strived to help others throughout her life, her family decided to create a GoFundMe page for her. Lara has lost her livelihood and her savings have been depleted. Her family want to ease her financial burden and help her cover her living expenses and medical needs. Emme’s tweet has certainly helped spread the word about her sister’s needs. Emme and Lara have received an outpouring of support in response to the tweet, with many of Emme’s followers responding that they’ve already donated to GoFundMe. And many have recounted similar stories of family members who had stage 4 cancer and who are still standing strong today. A look at Lara’s GoFundMe page as of this writing shows funding getting close to the stated $18,000 goal. This is great news for Lara and her family. Our thoughts are with Emme, Laura, and their family at this time. Stay tuned to the ABC soap and don’t forget to check CDL often for the latest General Hospital spoilers, updates, and news.